The LORD your God, who is going before you, will fight for you as he did in the wilderness. He carried you, as a father carries his son. This month marked the beginning of summer—a season when school’s out, the pool’s open, and the air smells of barbecue, sunscreen, and popsicles. It’s a time to connect with friends beside a campfire or splash in the surf with kids at the beach. June is also a time to celebrate dads during Father’s Day weekend. At Saddleback Church, we honored the many roles our fathers play in our lives— fixer, protector, leader, and superhero! On June 17 and 18, several of our campuses celebrated Father’s Day with food, fun, and games for the whole family. Not only was it a time to thank dads for the important role they play in our lives, but it was a chance to focus on our heavenly Father’s perfect example of parenting. As the ultimate model of what a father should be, God gives good and perfect gifts (James 1:17), he trains his children with principles for maturity (Proverbs 22:6), he has compassion (Psalm 103:13), and he disciplines out of love (Proverbs 3:12). Deuteronomy 1:31 tells us that God carries us like a father carries his son. Even in our darkest times, we can find comfort, hope, and strength in the arms of our heavenly Father. This month was another example of God’s love and faithfulness for his family that lives in Daring Faith. Thank you for your dedication to being his child, and for doing your part in faith to help build God’s kingdom. Here are just a few things your Saddleback family has been up to this month, working towards the five Daring F.A.I.T.H. goals. To help grow God’s family, several of our campuses hosted summer kickoff celebrations. On June 25, Saddleback San Diego threw an event to remember with food, games, waterslides, and an inflatable obstacle course. The family festival also featured presentations by the San Diego Police and Fire Departments, demonstrating our commitment and unity with the community. When it comes to summer fun, Saddleback Kids know how to make a splash! From June 26–30, over 280 campers headed to Lake Arrowhead in the San Bernardino Mountains for SK Summer Camp. Not only did students connect with God and with each other, but they also helped grow the church family by inviting new friends to join them during the action-packed week. Once again, God did big things in the lives of the next generation of disciples. It’s because of these exciting events, and dedicated leaders, that our church family is able to reach more people for Christ and help meet the “F” initiative of our Daring Faith goals. Saddleback Church is always looking for new ways to reach the community and meet people where they’re at, even if that means hosting sporting events to help fill God’s house. This month our Outreach Team launched Saddleback’s new indoor soccer league, Papi Fútbol Club. The fun, noncompetitive environment is a great place to build friendships and connect with others while playing indoor soccer. Read MORE about how these exciting Sunday games are serving new families in the community. In April, we shared the story of how Saddleback was laying the foundation for our new PEACE Farm. Located at our Rancho Capistrano campus, the 1.5-acre vegetable farm will harvest 20,000 pounds of fresh produce for our eight Food Pantries. On June 24, our members served at the PEACE Farm by painting, raking, and cutting wood for the last 12 planter boxes. The PEACE Farm is really taking shape and will help Saddleback feed more families through our PEACE Centers for the coming years! To be part of this life-changing project, contact Pastor Steve Mahnke at stevem@saddleback.com. Part of assisting people in need means inspiring students with a vision for what the church can do to educate the next generation. That’s why our members have been actively mentoring 530 high school students through Saddleback’s ministry, Good Neighbor Santa Ana. The program has been so successful, that the ministry plans to expand to 1,500 kids in 10 schools within the next year. Learn MORE about the pilot program that is impacting hundreds of youth in Orange County. This month our web and tech teams released several exciting new projects that are helping interconnect our growing fellowship through technology. Among them is a chat feature for our Online Campus, allowing users to communicate in real time and engage with other members during live services. That’s not the only new technology that was unveiled this month! Released at the June Purpose Driven Church Conference, the PEACE Virtual Reality (VR) Experience was designed to help ministry leaders experience PEACE-in-action through computer-generated simulation and 3D imaging. While wearing a VR headset, church leaders were visually transported to Rwanda’s western province where specific PEACE stories took place. Making the experience truly unique were village-scene backdrops and ambient sounds that replicated the Rwandan environment. Keep an eye out for this virtual experience coming to your campus soon! Click HERE to learn more about these technologies that are interconnecting our growing fellowship. 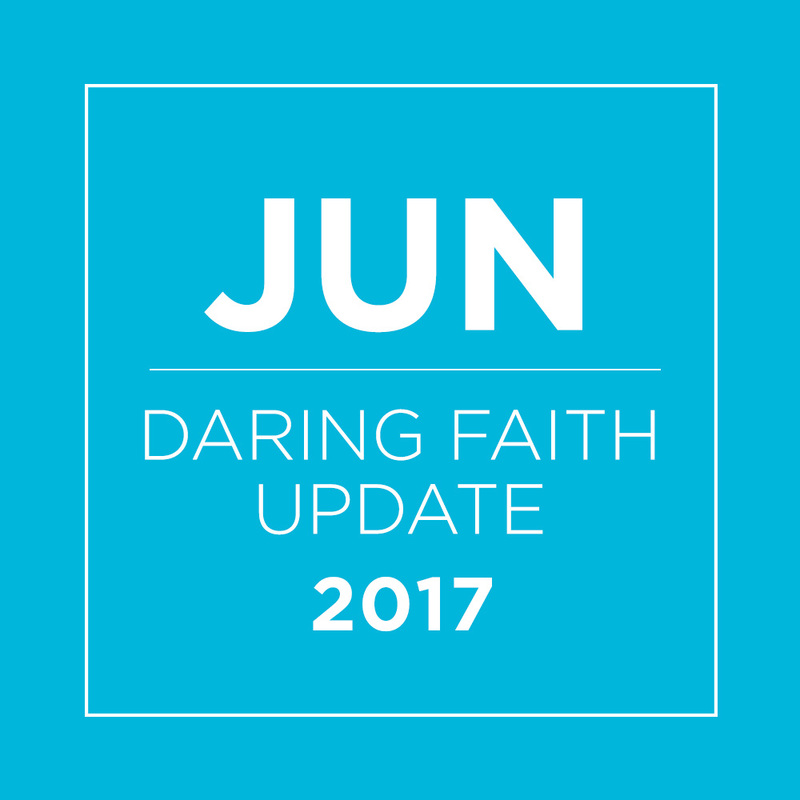 June was another successful month in working toward our Daring Faith “T” goal. Our members participated in nearly a dozen new training programs including Hong Kong’s Anointing Training, the SK Coach Gathering, the Summer Internship Training, and the annual MarCom Summit. Capping off the month was the annual Purpose Driven Church Conference that trained thousands of pastors from around the world, as well as our own Saddleback members and staff. Working toward our Daring Faith “T” initiative, the conference was a comprehensive training experience that will be the catalytic force of renewal, inspiration, and vision for leaders worldwide. This means we’re well on our way to training 25% of our members to be global leaders in the church and ministry. Between all 18 of our campuses, we now have over 800 ministry opportunities where you can serve and train to be a leader! To learn more about how you can get equipped through ministry and help us reach our Daring Faith “T” goal, click HERE. A major step in helping meet two Daring Faith initiatives—both the “T” and “H” goals—was the 2017 Purpose Driven Church Conference: Hope Renewed. 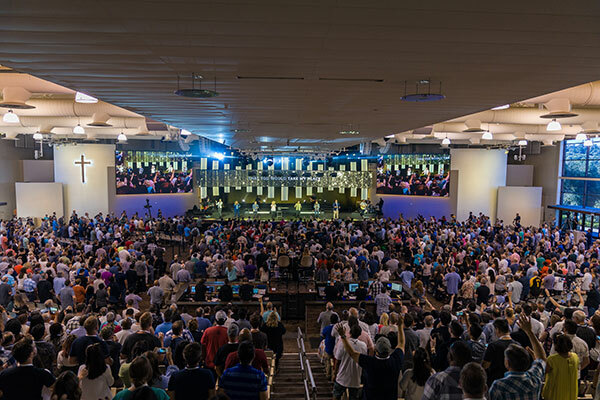 Held from June 27–29 at our Lake Forest campus, the event drew nearly 3,000 church leaders from across the globe. Click HERE to read the full PDC17 recap. Among those attending were pastors from Highlands Fellowship Church in Virginia. For nearly a decade, Highlands Fellowship was involved in missions in Tanzania. When they were recently asked to become an International Partnering Church with that nation, the union was instantaneous. Now, Purpose Driven training is underway in Tanzania’s four major cities! Read more about the partnership HERE. Also learning new ministry tools were leaders from Oak Ridge Baptist Church in Salisbury, Maryland. Their heart to reach the world for Christ started long before they learned of PEACE and the Purpose Driven Church. In 2016, when they learned of the need for International Partnering Churches in African countries, they stepped up to help fulfill the Great Commission. In less than a year, they’ve launched the Purpose Driven movement in the three countries of Benin, Togo, and Macedonia! Click HERE to read their remarkable story of faith. Taking the Purpose Driven Church to new levels was PDC17 attendee, Pastor Kim Ryan and his wife Anne. Nearly two decades ago, the couple launched North County Christ The King (NCCTK) church in Lynden, Washington. Pastor Kim was no stranger to the Purpose Driven Church movement, and had been studying the principles for over 20 years. When the Lord called Pastor Kim to abandon everything to rescue orphans and save the lost, he immediately dedicated the rest of his life to living out the PEACE Plan in India, Cambodia, and Vietnam. READ the powerful story of how one man was called to raise an army of PEACE champions. If you’re interested in watching the Purpose Driven Conference on-demand and being equipped to help train other churches around the world, visit PD.church. Thank you for your ongoing commitment to Daring Faith. YOU are the reason we can make a difference through these five God-inspired goals. HERE is just one story that represents hundreds of lives that are being transformed because of your sacrifice.